So I’m not sure if this counts as enabling or enablement. But the other day, after a month and a half of subtle (and not so subtle) hints being dropped on both sides, my Stylish sister-in-law finally pulled out my mother-in-law’s old sewing machine, a Janome Memory Craft 6000 (c. 1986) for us to play with. Now, as background here, my mother-in-law has assured us for years that, while her machine was the pinnacle of its breed back when it was new, it no longer worked well. In particular, the bobbin thread tangles. And a year or two ago, when we were visiting home, Stylish and I had poked gingerly at it (rather like poking a tiger in a cage, I think), and gotten absolutely nowhere. It’s a computerized machine with a drop-in bobbin and a sideways-lying spool for the thread—completely beyond my experience. The first few decorative stitches I tried were less than perfect, but the more of a workout we gave the machine, the better it behaved, and by the time I had finished stitching out series of letters and kitschy little penguins and alligators over pretty much every scrap of cloth Stylish could locate around her house (it turns out normal people don’t just have stuff like that lying around), it was humming along happily, even when I mashed five or six layers of denim under the foot to see what it would do. Now, there are people who love modern computerized machines for their wide range of functions. And there are people who love vintage machines for their sturdy reliability (I’ve long considered myself one of the latter). But I don’t know that there’s anyone who loves elderly computerized machines. (As with 80s patterns, I’m not sure it’s quite appropriate to apply the term “vintage” just yet.) That being said, Stylish and I had an almost unseemly amount of fun. Or rather, I had a ton of fun and she sat and looked on in bemused wonder (I’m going with wonder. Horror might have been a possibility). We swapped out feet (it has a wide array, all of which live in their own neat little slots in the top of the machine, almost none of which I recognized), played with the disgusting variety of programmed stitches, and I even managed to program it to make a keyhole buttonhole. And while I know there may well be no hope for it when the circuits do decide to finally go, they haven’t gone yet, so why not enjoy it while it lasts? I should mention, there was nary a hint of bobbin-tangling either. I thanked the sewing gods, repeatedly, for the small miracle that my mother-in-law actually kept the manuals to this machine (unlike for my, formerly her, serger) because we would’ve been flailing helplessly without them. For example, they revealed that to engage the manual control of the stitch length and width dials, you have to push them down like a button, first, lighting up a light, and then you can adjust as you see fit. Otherwise, it’s pre-programed, baby. In fact, we were sufficiently pleased with ourselves that by the time we had to go actually do grown-up responsible things, we set ourselves to clearing out the lone under-utilized space in Stylish’s (not large) house, unearthing her Papa’s old treadle* for a sewing table, and setting up a teeny little sewing space. It’s not fully functional yet—she has an ironing board (I think left by the previous homeowner) but no iron—but it’s something. And she spent a good chunk of the evening sorting through all the patterns on my phone app, and making a list of her favourites. I’m still not sure if I’m spreading the sewing bug or just getting suckered into Sewing For Others, but I had a lot of fun, Stylish had at least a little fun, and I’m not sure but I think the Memory Craft had fun, too. *Papa was, in fact, Stylish and Osiris’s great-grandfather, who lived to be 94 and used the treadle, a handsome old Singer, for stitching harness and various other manly things. It probably deserves its own post, so I won’t talk too much about it here. I’ll be looking forward to the post on the treadle machine. I’m curious about its age, for one. I still haven’t tried the treadle that I bought just about a year ago; this whole having a “real job” thing (and the fact that it turns my brain into spongecake most evenings) is a real inconvenience. So why don’t you just get that one rolling along and then I’ll pick your brain about it, ‘K? I have an ancient semi-computerized machine (a Bernina 1080QE) and I LOVE IT!! Sews better than any other machine I’ve used, perfect even stitches, all metal insides. Don’t knock those old workhorses! Hey, if they’re working I don’t knock anything! 🙂 This one is impressively solid and still feels old-machine heavy—you know what I mean. What a neat machine! Good for you, spreading the sewing bug. I have an old Janome Memorycraft 4000, which I keep as my backup and kid’s machine. I suspect your 6000 is similar, only with more stitches. They are “self-oiling”, but the oil reservoirs need to be topped off occasionally. I pay a local repair guy to clean out and reoil the machine once a year (of heavy use) or once every few years. Otherwise, you can do grind metal on metal. My old Janome does not do as many things as my Bernina, but it is a great workhorse with fantastic stitch quality. It’s worth paying the ~$100 for a general tune-up. How fun! I was talking to a running friend yesterday about how once you have a hobby that you love, getting others hooked becomes an all consuming activity. Its always more fun to be able to share an activity with friends. Yeah, I sort of yoyo between babbling excitedly and wondering how badly I’m boring everyone… It’s funny, I know a lot of people who costume sew, but not many who are really serious about it. /sigh. I had the same machine, handed down from my mom. But alas, it started behaving badly and the repair guy said it was too far gone to repair. Luckily by that time mom had another one to pass down to me, that has even more computerized features. Since these machines are all I’ve known I think it’d be a big learning curve if I had to switch to one without a zillion features. I miss that red button. My current one actually doesn’t have that feature, but a tap on the pedal will do it. That looks just like my treadle! Fun. Don’t you feel a little bit like a pusher 😉 ? It always surprises me that other people don’t have fabric or patterns lying around. What on earth do they to with themselves in their spare time? I have that inbuilt-automatic-hand-goes-to-the-handwheel-needle-adjust too and I wonder what I will do when I one-day have to upgrade to a fancier machine that does the needle position for me. Will it ever go away? I drove a manual car since I learnt to drive and now also drive an automatic, I still try for a phantom clutch occasionally, makes my shin ache, I am sure it will be the same with an electronic sewing machine. this isn’t my newest computerized machine, where i keep my current major project, but i have, and use almost daily for one thing or another, the memory craft 8000 from when it was still called new home. mine is from 1995 and is still a workhorse. i have no problem whatsoever getting it serviced when it does need maintenance which is hardly ever (i think 2x). my design book looks almost exactly like yours and i’d bet that the differences are minimal. if mine dropped dead tomorrow, i would replace it with a janome in a flash, but without all the fancy-schmancy stitches, since my viking has enough that i don’t use (both gifts from mister 2). the new home was a replacement for my necchi with cams that i got in 1956 from my dad for my birthday. i used that until 1995, when the necchi just up and died. Haha sounds like a fun little afternoon! I hope Stylish Sister-in-Law agrees with that. 😀 I think it sounds like you’re close to converting her. A few more pushes and a successful me-made garment will probably do the trick! I love my 70’s Kenmore, but I wish I had a few more stitch styles on it. Even just a 3 stitch zigzag would be great (I think that’s what it’s called, when there’s multiple stitches on each arm of the zigzag). My Grandma’s 80’s Kenmore has some pretty stitches that I’m a bit envious of. But the Memory Craft totally blows it out of the water! oh, this post made me so happy to read! I adopted an unused early 1990s bernina and leanred to use it with my mom, who had always used her grandmother’s machine. my mom is constantly reaching for the wheel to get the needle up (just tap the pedal once, mom!). we always laugh at it. and it remonds me exacltly of driving an automatic as kaitui_kiwi above points out 🙂 (ever gotten really desperate to put the clutch in and slammed in the E brake with your left foot??) I have And come to think of it my mom has too 🙂 My real point is, though, that I adore this machine. When I started sewing I thought maybe I just wasn’t aware of tension problems or all these other issues other seamsters have. But no, now I know enough to know my machine just doesn’t give me any problems of that sort! I hope you and Stylish keep the janome’s life going. 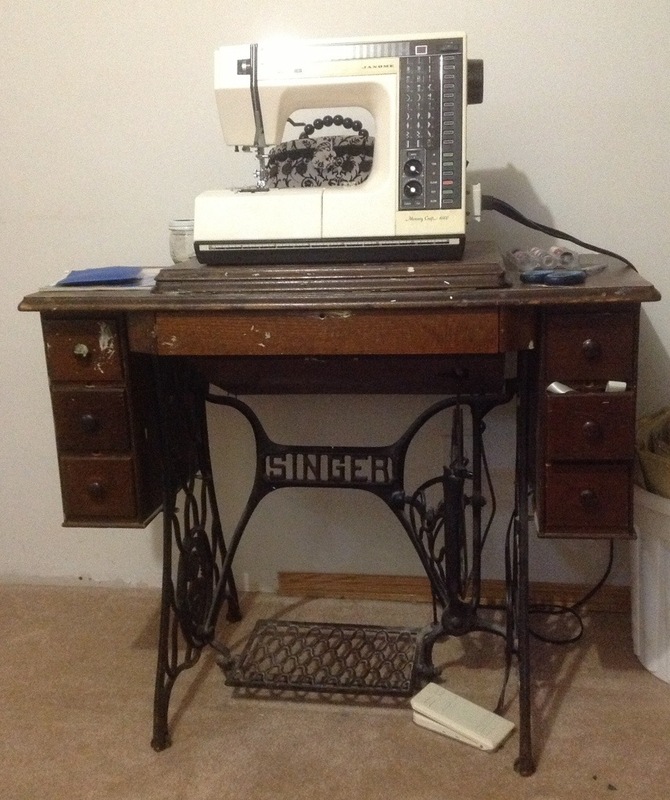 I was happy to run across your blog on regarding the Memory Craft 6000 sewing machine. My husband purchased one for me when it first came out. I believe around 1986. It was the top of the line at that time for Janome. 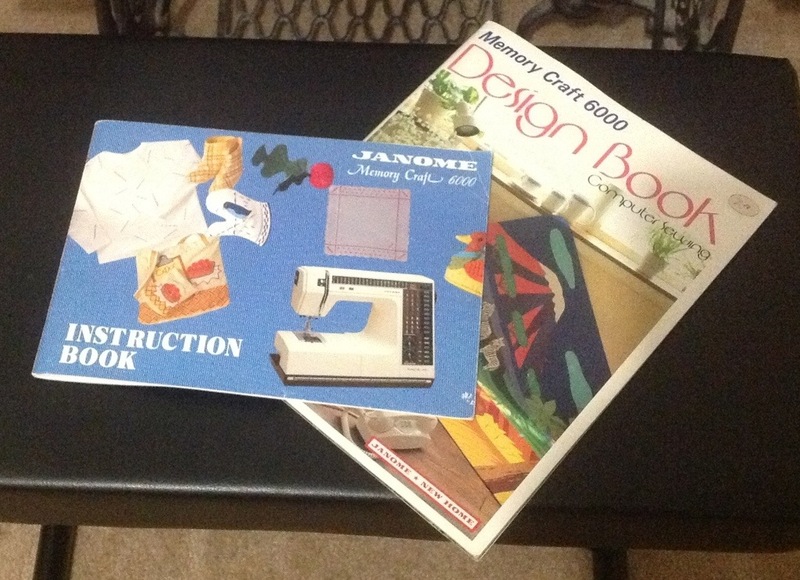 I later purchased the Janome memory Craft 9000. My 9000 is no longer working as of 2012 and the company states that it is outdated and they no longer make parts for the 9000. So I went back to my 6000 which is still working and I love it so much. It is all of what you said heavy duty and all. I will never get rid of it as long as it keeps running and I can have it fix if I ever need to, I love the steel body and that I can count on it. I have 4 vintage sewing machines and will forever stay with them. They are more dependable then the new computerzied ones. Not knocking the new ones but for the prices these days it’s like buying a new car. So keep the 6000 as long as you can. One last note…I even have a video of a tv program that was on tv when the 6000 was released. It is a taping of about 5 shows of how to use this machine. Enjoy and happy sewing. I bought a Janome Memory Craft 6000 but there is not Instruction Manual, if anyone is able to help me, would be really happy. I would love to have a video of Janome MC6000 as I don’t have any manuals. Do you know where I might purchase one? As I mentioned in my first post that,.,,,”One last note…I even have a video of a tv program that was on tv when the 6000 was released. It is a taping of about 5 shows of how to use this machine. Enjoy and happy sewing.” Let me know if you would like to have a copy of the dvd. This dvd was not sold in stores, someone took the time to record the tv show that featured the MC6000 Sewing Machine, I think it is about 1 hour long. This DVD is not a detailed step by step instruction video, but gives enough exciting info to get you familiar with this wonderful sewing machine. Once you view the video you will appreciate all the features that the 6000 have to offer. I still use mine and really loooovvve it. I wish I could find another mc 9000. The one I have will cost TOO much to have fixed. Let me know if you would like a copy of the dvd I have on the MC6000???? If you have the machine set to straight stitch, you can use the stitch-width dial to control the position of the needle, I believe. You have to push on the dial like a button to turn it on, though—a red light will come on. I have this machine, too. Thanks to grandmother who passed away! Keep blogging about it, please!! I’m happy to come across this page. 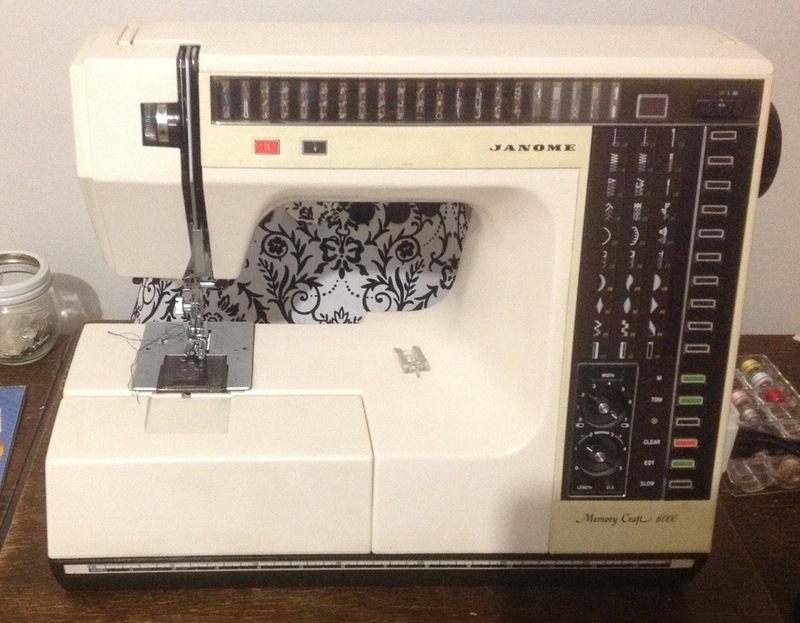 I have a new-to-me Janome MC6000 which I took out of my mother’s storage. She didn’t use it much so I hope I can get some years of sewing out of it. It’s very heavy and the case has yellowed but it works way better than my other brand new machine. Love sewing with it so far. Thanks for the info. I too have had a janome 6000 since the day thry were released….only now showing signs of wear such as the removable storage box has a broken ‘knob’ so it wont stay in place and the needle threader is broken….so little wrong how can i justify a new machine. Also we have a singer treadle with a serial number but not followed by a letter of the alphabet. We r told it is very old …any ideas?? The vaneer is peeling from the top but the cover case is in good nic…would like to know if its worth anything at all?? Many thanks for reading. If you check the Singer website they have serial number listings for their old machines that should give you an idea of when it was built. And if you google around a bit there’s quite a bit of info. (I’d start with the ISMACS website) it sounds like a cool machine! Old treadles aren’t worth a whole lot, especially if the veneer isn’t perfect, as the supply tends to exceed the demand. It depends a lot on area, too, though. My mother bought her MC 6000 from Goodwill and it didn’t come with a manual. I have been looking on the internet for one but I’m in high school and can’t buy them. Could I possibly get pictures of your manual? It would be much appreicated. shakeelawan922@gmail.com I am in dire need of Manual of Memory Craft 6000. Will be your greatful in mail to me plz . . . . .
currently I’m looking for the manual for this Janome MC6000, would appeciate if you could share the manual.